You may remember from an earlier post that our project of the summer was to finally tackle our backyard. We wanted to turn it from it’s complete bare situation to a space fit for entertaining, relaxing after work or even cozying up by a fire when cooler months arrive. To say that this project was a labour of love is no joke! We kicked things off at the close of May but between work schedules, family events, a few setbacks and more – I’m happy to finally reveal the before and after. To recap, we started off with a complete blank slate. The only work we had done in our backyard was stonework which we installed in early fall of 2016. With this as our starting point, we knew we needed to add a conversation set, add trees for privacy, address a lighting issue (we only have one light mounted to the back of the house) and spruce things up since a cookie-cutter suburban backyard can often be anything but chic. We did kick off the project with a budget in mind of how much we wanted to spend and where we thought we’d net out. We found ourselves over budget BUT not as bad as I thought it would be ($400). Working with a strict amount in mind, it was time to get creative: digging up gift cards, managing the planting ourselves and using the Membership Rewards points from our American Express Canada Platinum Card. I feel like this aspect is often overlooked on monthly statements, but all those vacations, dining experiences, clothing purchases and even gas fill-ups add up to give you this amazing nest egg of points that you can use towards whatever you wish. I think what’s even more amazing about this program is its flexibility. With other card loyalty programs, you’re often limited to specific retailers and big box stores but with Amex, we could actually redeem our points at a local nursery down the street where we purchased our trees. After making our purchase, we simply logged onto the app, applied our points to our purchase and within a few days we received a bill credit in the equivalent amount. This was reassuring since let’s be honest – spending your budget on things like trees, flowers, mulch and soil isn’t exactly what I like to use my hard-earned money for. Thankfully, we were also able to roll with most of the items we found inspired us in the backyard inspiration board. 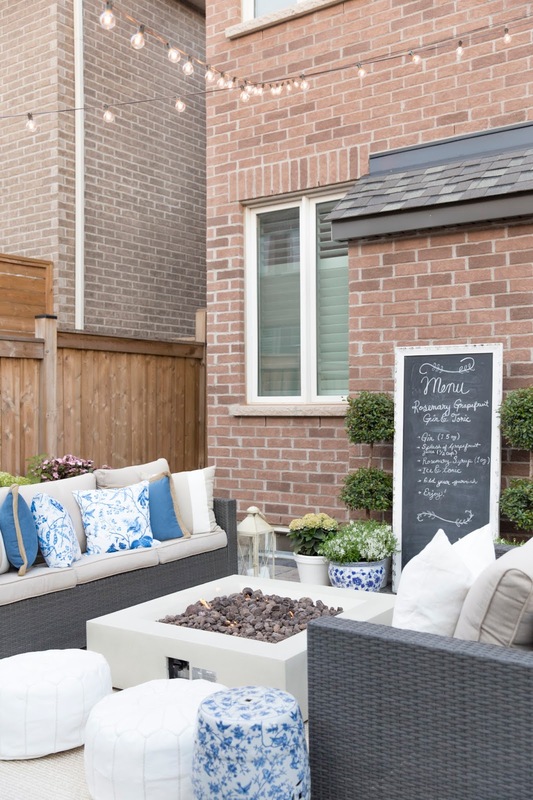 We thought a white, blue and cream theme would go nice to help brighten the space and differentiate fabrics from the go-to Canadian patio colour of choice: brown (ugh!). 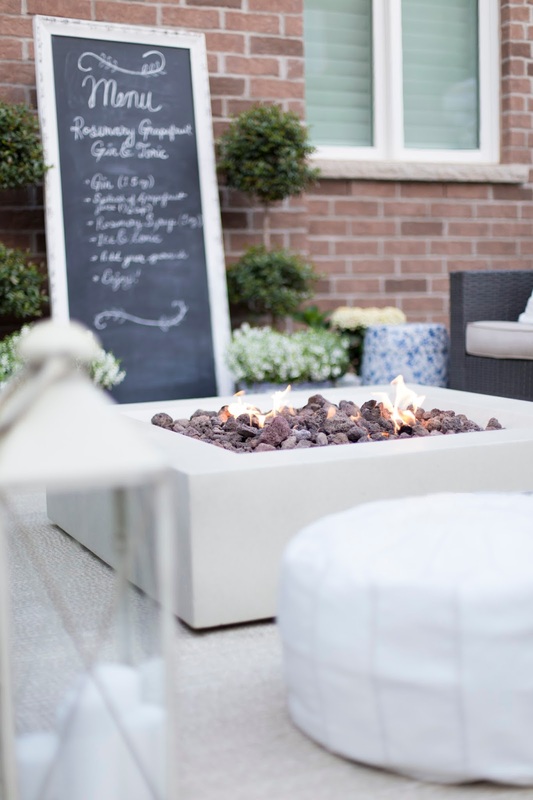 The couch and chairs fit perfectly in the space and our favourite piece of all – the firepit – is just an amazing touch. We love coming outside at night with cocktails and hang out by the fire or having friends over and roasting marshmallows! I love how the firepit has helped to extend the use of our backyard into cooler months. We also had some help from our friends at Wayfair Canada and Roostery for fabrics. Since we were already working with a patio set from the previous year, we picked out an adorable umbrella stand, conversation set, fire pit and planters to help fill out the conversation area. We’ve ordered quite a few items from tWayfair in the past and I must say, we’ve always had a wonderful experience with their customer service team. From the point of delivery to ordering, you’re in constant communication. I was also super impressed when the delivery team dropped off our order in the backyard rather than leaving it on the front porch and for an entire day while we were at work. When searching for the perfect finishing touches, I came across this blue and white pattern from Roostery and immediately fell in love. The bright contrast really punched up the space and will look stunning next year when our hydrangeas come in on either side of the garden (if we can keep them alive!). I incorporated the pattern into cotton napkins and pillows on the sofa set to tie in the two separate living spaces. Remember that using your Membership Rewards points from your Amex for large-scale design projects can help you meet and even stay under budget! Thank you to American Express for sponsoring this post. All thoughts and opinions expressed are my own. 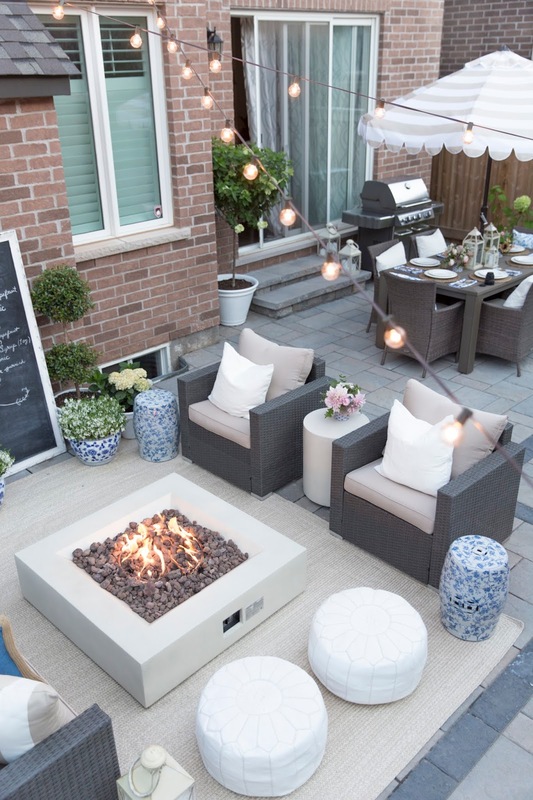 We have a fairly spacious back yard by city standards and I'd love to do something like this but don't know what to do with it in our Canadian winter. Do you leave everything outside? Store it? We use our garage for the cars and I can't imagine bringing everything into the house. What will you do? OMG. This is to DIE forrrrr!! I love everything about it! The furniture is absolutely gorgeous! Love this space! Especially love the firepit you chose. The colours blend so nicely together. Gorgeous. Roostery is new to me, so excited to check it out. I haven't ordered from Joss & Main yet, is it a hassle to get it delivered to Canada? It looks great! I love this style of patio furniture. It help to increase the value of our home.